Reflections of a Newsosaur: How close to default is your paper? Are these same rating agencies that said CDOs are AAA gold? How did that work out? Are these same rating agencies that said Enron was AAA right up to one of the largest bankruptcy in American history. I like your analysis but I would not couch the conflicted ratings agencies for the basis of the analysis. Where is Lee? I am sitting on 500+ shares that are getting close to worthless. You've posted the news graphic that all designers need to heed - especially those at the Tribune papers. 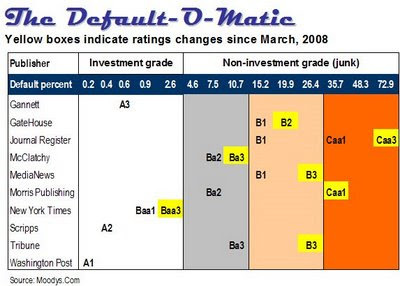 Lee is not rated by Moody's; hence it is not included in the Default-O-Matic. I will try to get at the information in another way. Stay tuned. Is it not correct that companies pay Moodys for these ratings, and therefore they might not be an accurate reflection of the true financial state of these companies? For example, I believe GCI is in more dire straits than this rating table might indicate. Is Media General, like Lee, not rated by Moody's? The last bond rated for Media General has been paid off, so there is no current rating from Moody's, according to MEG. Update your chart. S&P downgraded MediaNews from B- to CCC last Thursday. The S&P downgrade mentioned in the prior comment would put MediaNews approximately one notch lower than shown on the Moody's scale that is used in the Default-O-Matic. I decided to use the Moody's ratings because I had access to historical information, but the services generally track pretty closely to one another. What about Freedom Communications? In June, Moody's dropped its rating to B2 (http://www.alacrastore.com/storecontent/moodys/PR_157243_807406505). So would that put it in the 19.9% chance of default category?